A good weekend for John Allen Special should have been great... but a slight tap and a $.02 part cost us two probably top fives. Saturday the car ran perfectly. Zero hiccups all day long. If you want to talk about someone punching above their weight class, we felt like we were that guy on Saturday. Big thanks to David McDaniel and Chip for coming out to drive this weekend. It gave us a very solid lineup to go out and compete with. Sitting 5th with 20mins to go we got tangled up a bit with the #501 as he lost it going up the hill towards turn 12. Ended up in the penalty box and moved us from 5th to 7th to finish. Sunday we once again started out hot. We'd pushed our way to 6th place with eyes on the top 5 again when a C-Clip fell out of our shift linkage forcing Chip to park trackside and wait for a flat tow back to the paddock. 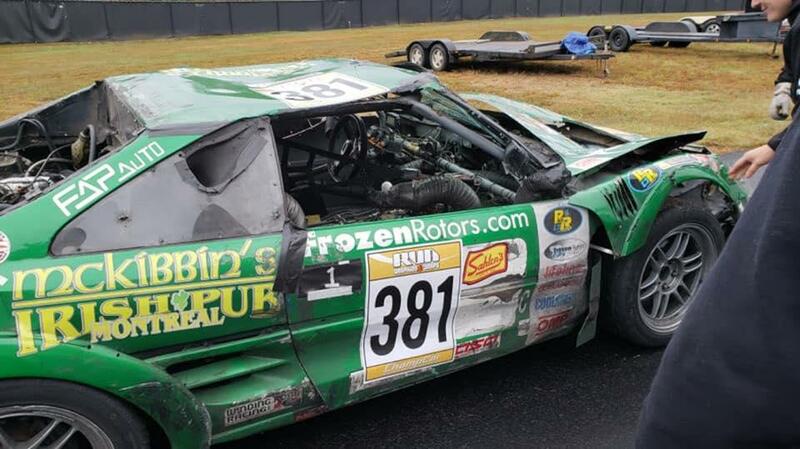 20 minutes later we were back on track turning laps, but the damage was done. Crawled our way back into the top twenty and drove the car on the trailer. Can't complain too loudly. 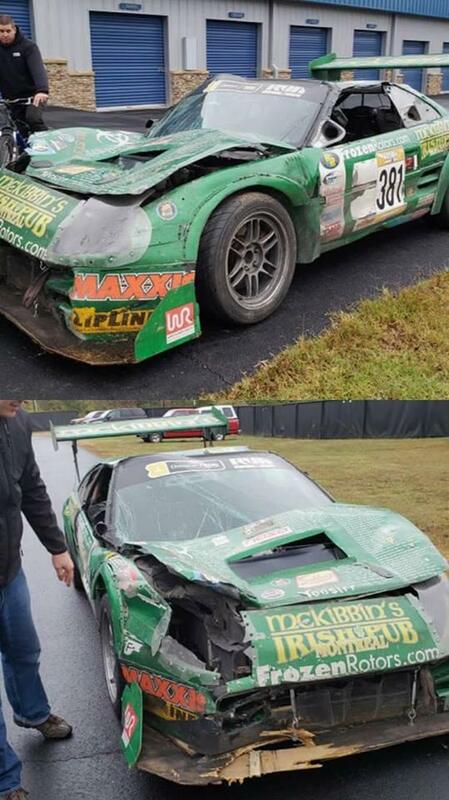 So... are there any pictures of the smashed up MR2? Oh.... and possibly video? It's starts every race smashed up. Wrecking it changes little now. At what point does the Porsche team get a serious talking to and removed from the series for at least several races? They hit us at Sebring in the bus stop. Thankfully it wasn't anywhere near as bad as it could have been. They put the Corvette Summer Miata out of the race at Sebring (after having apparently enough contacts earlier in the race to rip off the front and rear bumper covers). They just put Troy out of the race at AMP. Clearly, these guys are dangerous on-track. Oh I was asking about video from AMP. Thanks for playing though. Never got a look at either car but from the large pile of airborne parts witnessed, and the flagger holding his head with both hands for 1+min afterward, that car should be in no shape.... perhaps/hopefully *soon* they figure out how to run cleaner? I could post you stills of Bio, and you'd swear it was totaled. Then Troy somehow fixed it again, enough to lead briefly Sunday until a couple of contacts and a broken exhaust. It will race again with some new bodywork at WGI according to Troy. Heck, you were on the apex curbing and they went through the grass to pass/hit you. Unreal!!! They need a serious talking to, or possible ban due to the number of incidents that re continually adding up. When it gets to the point that they are ruining other people's races and cars, enough is enough. Heck, you were on the apex curbing and they went through the grass to pass/hit you. Unreal!!! They need a serious talking to, or possible ban due to the number of incidents that re continually adding up. When it gets to the p﻿oint that they are ruining other people's races and cars, enough is enough. Yes, I get it. My understanding is the same Porsche had contact with Bio. That car is a hazard to the field (the Porsche, not Bio). That car is a hazard to the field (the Porsche, not Bio). @Bill Strong MAY have some video at some point from one of his cameras. Turn 16 curbing/paint at track out got the car loose, driver tried to correct twice and the car got away from him. Pounded inside wall and then Troy’s car came through. ^ Yes. he was sideways as he came around the corner. If you would, I'd be curious. You know that was a legitimate lap, right? Fixing Troy's car was fun. The wreck pushed the wheelbase on one side 3/4" back, along with the windshield which cracked it. Troy thought it was totaled, I convinced him to move one of the radius rod (front leg of the control arm) bushings from on either side of the chassis mount to in front of the mount. This shortened the radius rod about an inch, and got the wheelbase within 1/8" so the wheels could roll and turn again. We got the toe straight, the caster was clearly different left to right. Pounded body stuff back out, patched up the aero as best we could and went sans windshield. Later found someone had a x finity (nascar feeder series) windshield we put on to start day 2.